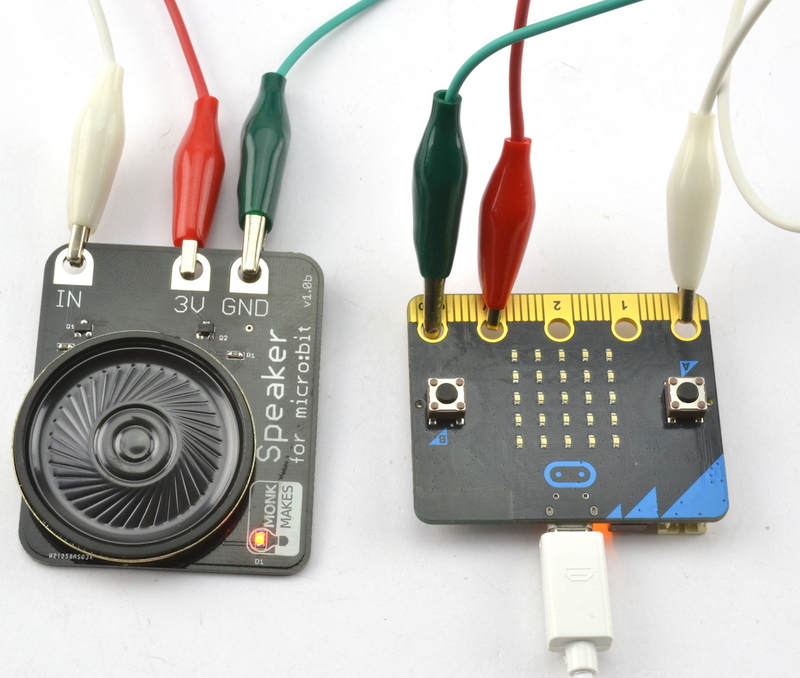 The MonkMakes Speaker for micro:bit is a neat little amplified speaker that connects to your micro:bit using alligator clips. Despite its small size, this speaker is pretty loud. Connect the Speaker to the micro:bit as shown below. When attaching the alligator clips to the micro:bit, make sure that the clips are perpendicular to the board so that they are not touching any of the neighbouring connectors on the micro:bit edge connector. The quickest way to try out your speaker is to DOWNLOAD THIS HEX FILE and then copy it onto your micro:bit. Press Button A to hear a tune being played. Visit the Blocks Editor in your browser and then from the input section add an on button A pressed block then from the music section add a start melody block and select the tune you want to play (in this case, entertainer). Click Download and then copy the file onto your micro:bit. You can also open the project in the Blocks Editor by clicking on the image below. When you press button A you will hear the tune “The Entertainer” play through the speaker. As well as this board, we also have a Relay for micro:bit and a Sensor for micro:bit. We also have an Electronics Starter Kit for micro:bit that includes all three boards, a project booklet and other useful components to build yourself some great micro:bit projects.